Oh my goodness…. it’s #shiplap time. 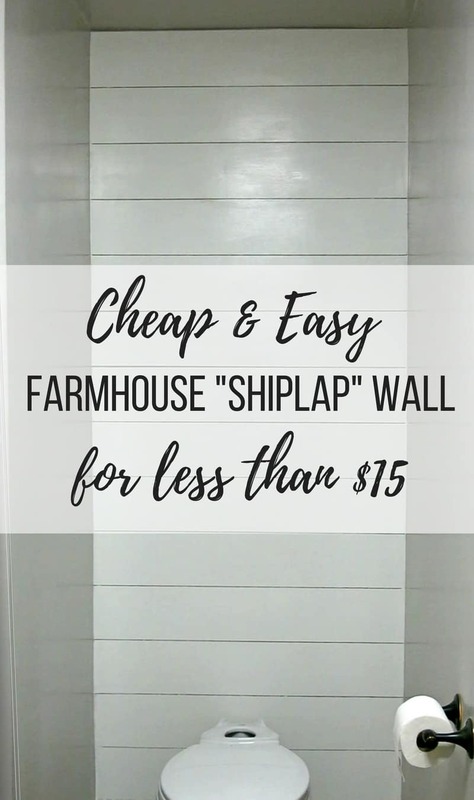 Today we’re going to walk you through the simple steps on how to install a faux shiplap wall on the cheap. 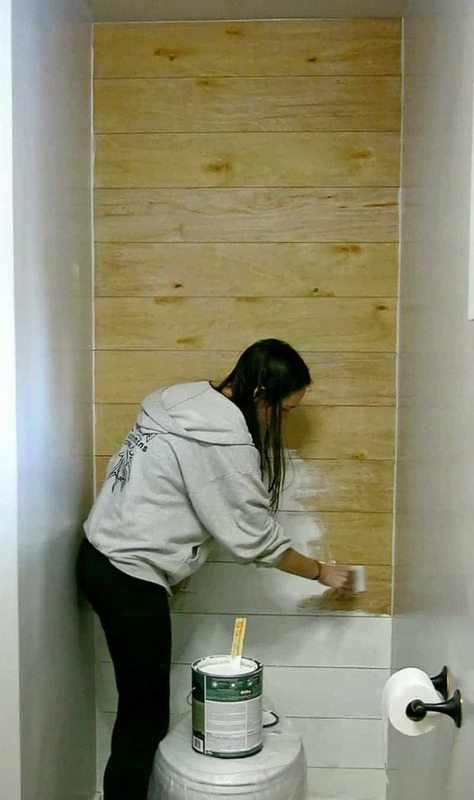 You’ll be amazed by the crazy transformation the faux shiplap wall made in our farmhouse bathroom. If you love DIY videos, be sure to subscribe to my YouTube channel here. If you’re looking for a DIY update for your bathroom that you can start in and finish in one weekend (and I mean one weekend where you have normal life going on…not one weekend where the whole crew comes in and finishes a house in one weekend…seriously, how do they even do that!?) – this is it! I promise to keep this guide on how to install a faux shiplap wall super simple. UPDATE: Here’s how the farmhouse master bathroom turned out. Check out the full room reveal. This tutorial on how to install a faux shiplap wall contains affiliate links, but nothing that I wouldn’t wholeheartedly recommend anyway! Read my full disclosure here. Let’s just take a peek back to what this area looked like when we moved in. Scary…I know! Since then, we (by that I mean Logan…most of the hard work was done while I was pregnant so I had a good excuse for not being able to help a lot….if you see the size of this bathroom, there definitely wouldn’t have been room for him and me/my big ‘ol belly) have skim coated the walls…which is just a fancy word for making the texture smooth. The texture throughout the entire house was hideous. It looked like someone took dry wall mud and had a splatter paint party. 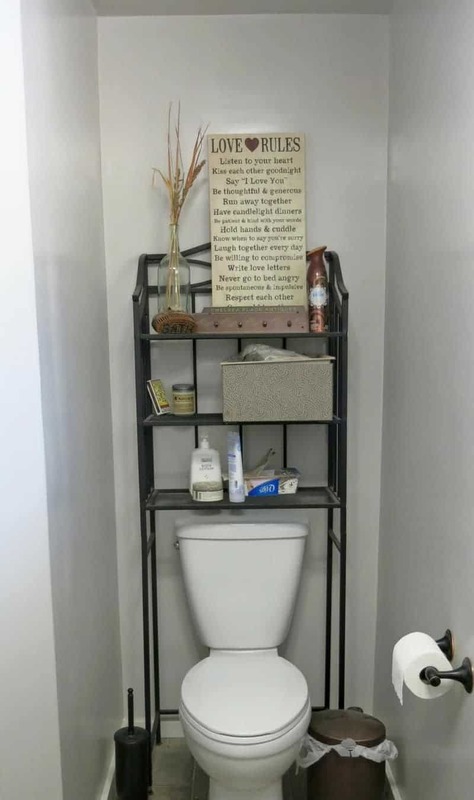 After skim coating, we painted (Burnished Clay by Behr if you’re wondering), replaced the toilet with this one and put our clunky storage shelves in place. A few weeks ago we got a little DIY bug. Logan and I have both been going kind of stir crazy with the bad weather all winter (Spring, please hurry up already). We decided to tackle some super easy and budget-friendly transformations to our boring master bathroom and it all started with shiplap. I’ve been wanting to do something…really ANYTHING… to the wall behind our toilet that housed those ugly shelves. We’ve had the shelves for years and…let’s just be honest, I’ve always kind of hated them, but we needed the extra storage in all three houses we’ve lived in since getting married. So there they stayed behind the toilet collecting dust and clutter. After getting Logan to sit down and watch some Fixer Upper with me and then showed him my friend’s faux shiplap wall from Making Joy and Pretty Things (you gotta check it out! ), I finally convinced him that shiplap is a necessity. The problem was real shiplap is EXPENSIVE!!! We’re talkin’ at least $60 for the wood to cover this small wall! We only spent $12 bucks on the wood for our faux shiplap. Are you ready to see how to install a faux shiplap wall? Ok, first things first…. what will you need? Here’s the supplies for the faux shiplap wall. Nickle…yep that’s right a nickle from your wallet. I promise I’ll explain! If you really don’t have access to any hand tools, I think you can kindly ask the employees at Home Depot to cut the wood for you when you buy it, but this just depends on the store. Ok, let’s get started on this guide on how to install a faux shiplap wall. Step 1. Remove tank from toilet. 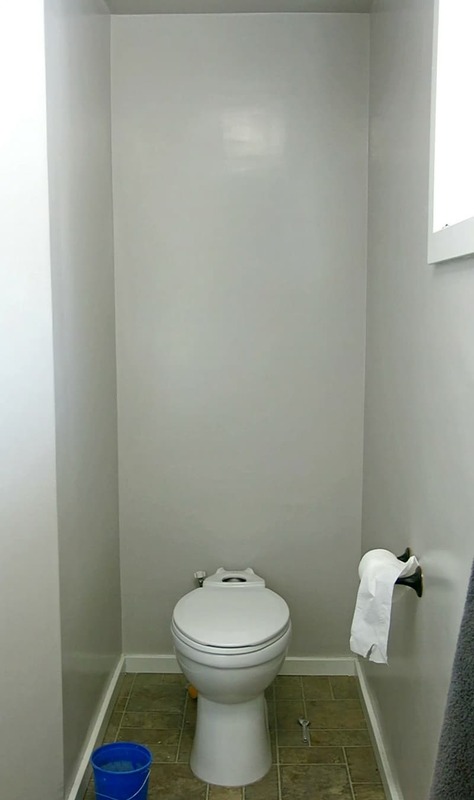 By removing the tank from your toilet, you’ll be able to work on the wall MUCH easier. It’s worth the “extra” step, trust me. If you’re wondering how to remove the tank of the toilet, here’s simple directions. You only need to follow steps 1 and 2 on those directions though, unless you wanted to remove the whole toilet…which I don’t think is necessary. Step 2. Paint your wall. You definitely want to paint your wall with one light coat of whatever color is going to go on top of the faux shiplap (this white, in our case). Don’t worry about the edges or getting it perfect. The only reason you’re painting this is for the gaps between the planks that will peek through. If your wall is a really dark color and you’re planning on doing a light shade on the faux shiplap, you’ll want to be more careful to get all the edges and you’ll probably want to do more than one coat. Step 3. Cut wood to size. Next you want to get all of your wood cut down to size. 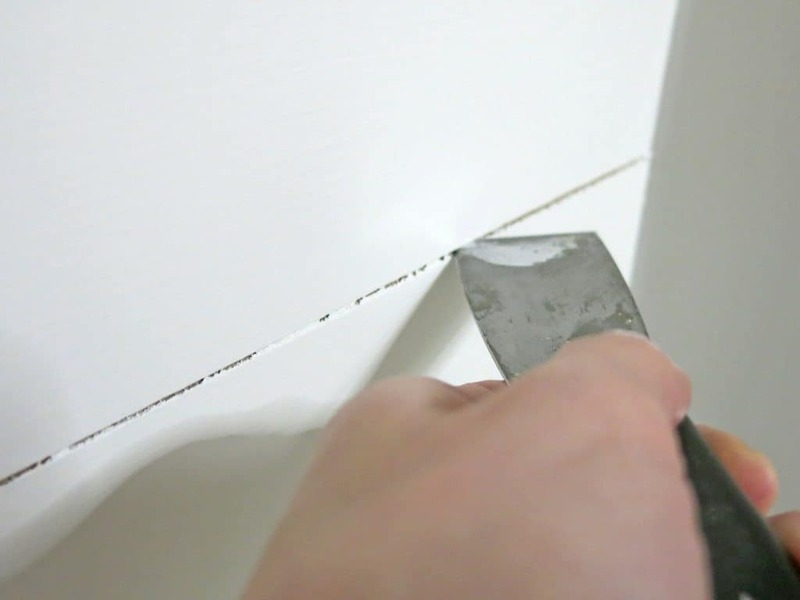 Measure your wall’s width and start making the cuts. We cut our boards 6 inches tall. You don’t have a table saw either?! No problem… take a look at how we make it work with the tools we do have. Logan sets up a guide board (1×1 that we had laying around the garage) and secures it to the boards he’s cutting with clamps. 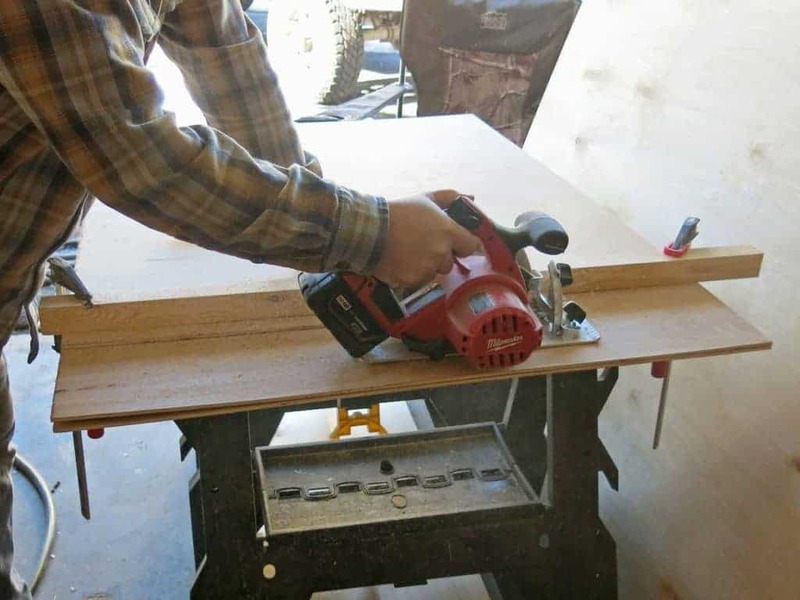 He measures the distance that the blade is from the left side of the circular saw and adjusts the guide accordingly. 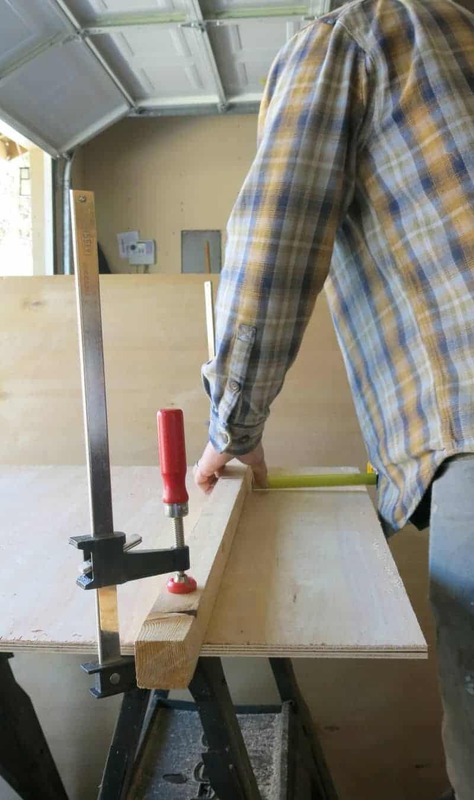 After making sure it’s straight, you just cut the wood using the guide on your left. Tada! Step 4. Nail wood to wall. Be sure to start the top of the wall and work your way down. 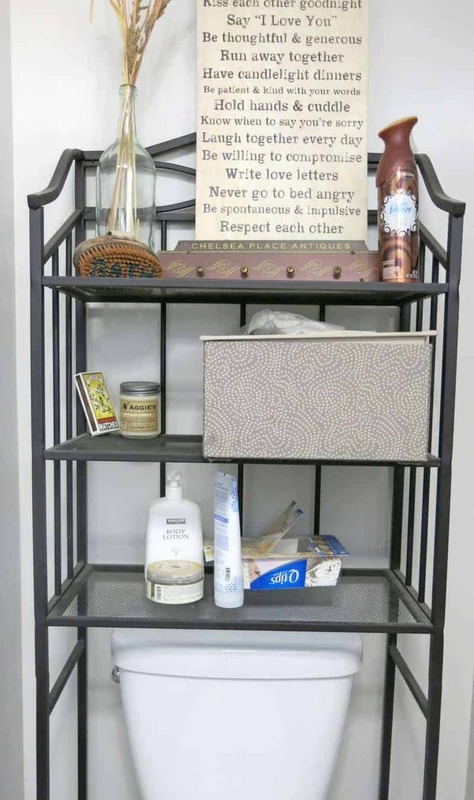 If you have a skinny piece, you want it to be at the bottom of the wall so it is less noticeable. Be sure to keep the planks level as you move your way down the wall by holding the level on the bottom of the planks as you attach them. Ready for handy tip? 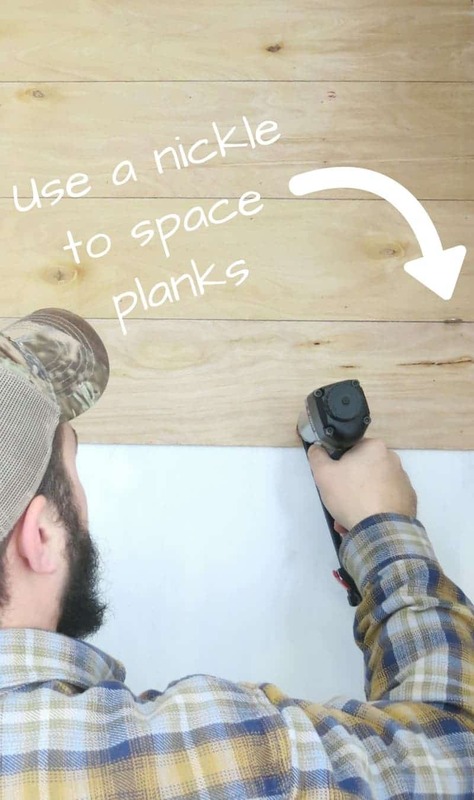 Use a nickle to space your planks out on your faux shiplap wall! Put one on both the left and the right of the wall (and in the middle if your wall is larger). Run a thin bead of caulk on the corner and then use your finger to smooth it out. 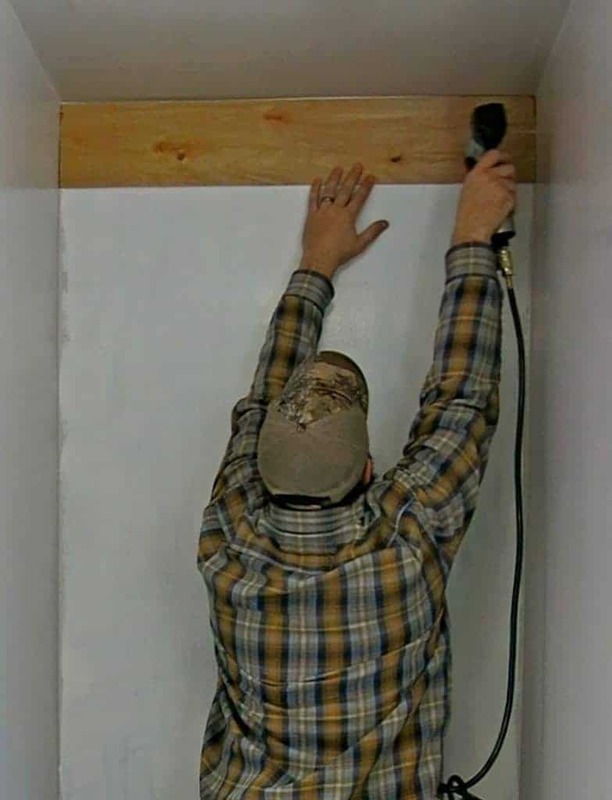 The purpose of this so that there is a nice clean line for your paint (same reason you always want to caulk the edges of trim before you paint). Step 6. Patch nail holes and sand. This is pretty simple. All you do is apply a dab of putty on your nail holes and then rub off the excess. 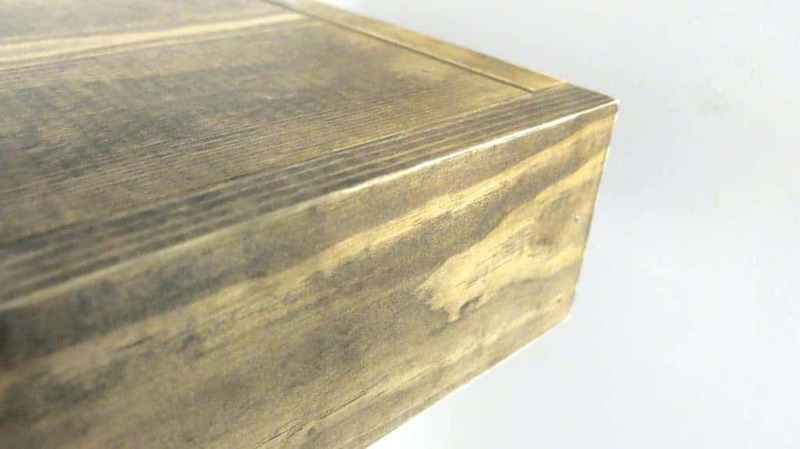 To finish up, be sure you sand the areas you patched with some 220-grit sandpaper to make the finish smooth. You don’t want to skip sanding because you’ll see the marks on the surface where the putty was. Step 7. Paint your faux shiplap wall. We used Behr’s Snowy Pine and did 3 coats. 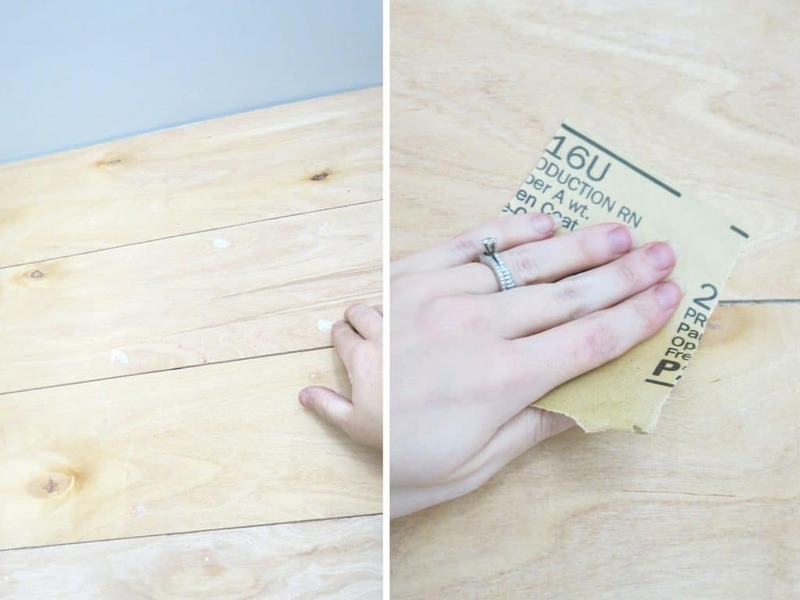 Be sure to cover your floors and toilet and be careful on the edges when you are cutting in (or use some painter’s tape). 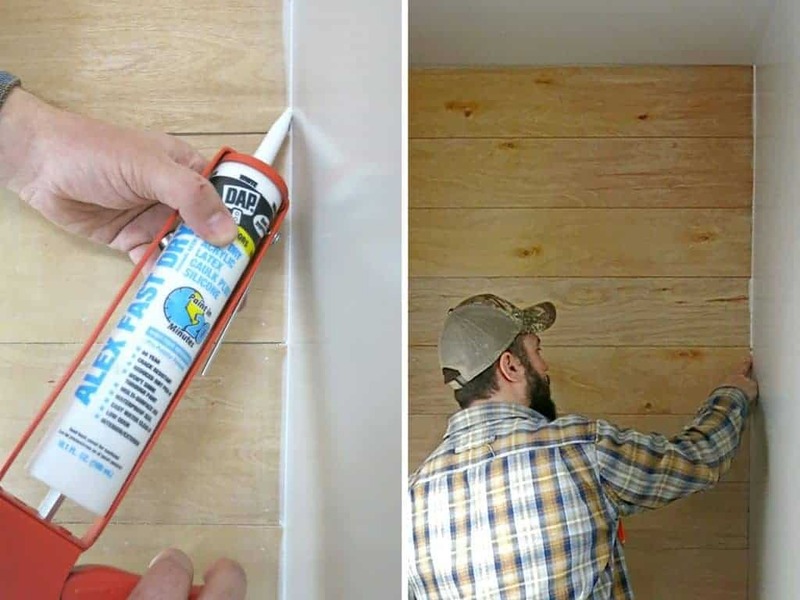 A lot of people asked why I used a paint brush instead of a roller for the shiplap wall, let me explain! I was worried a roller would get the paint on too thick in the cracks between the wood and I would end up with tons of the paint drips. With the brush, I was able to control how thick the paint went out and avoided laying it on heavily on the cracks. It didn’t take me much time at all to paint the small wall by hand! Step 8. Scrape the gaps between the faux shiplap planks. After you finish painting, you’ll probably run into some drips of paint between the planks, even if you use a paint brush and not a roller. This is super easy to solve. Just run something straight through the edge of the gaps. I used a putty knife, but you could use a credit card or something like that too. Step back, pat yourself on the back and go binge watch some more Fixer Upper. That was easy, right?! After we finished, we were both kind of shocked at the crazy transformation. It was so stinkin’ easy! 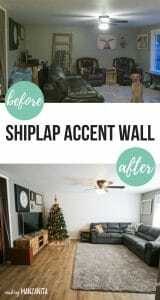 The best part about this faux shiplap wall is that it was SUPER inexpensive. Assuming you already have the paint, brushes, nails and all the tools on hand – this will cost you less than $15!! What do you think? Did you love this guide on how to install a faux shiplap wall? Do you have convinced your hubby on adding some farmhouse shiplap in your house yet? Did you use real shiplap or faux shiplap? I can’t wait to show you the next simple DIY we did in our farmhouse master bathroom…. floating shelves to go on our shiplap wall. 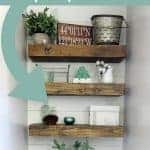 Check out the full tutorial for our floating shelves here! The video of our faux shiplap wall and floating shelves in our farmhouse master bathroom literally went VIRAL. It was so cool to see something that we did get noticed by SO many people. 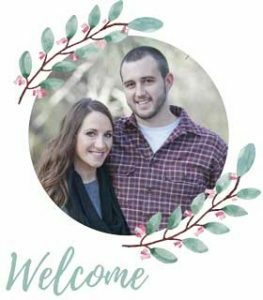 If you are not one of the 20,000,000 people that saw this on Hometalk’s Facebook page, here’s a little time lapse version of our transformation (and a sneak peek at the super cute farmhouse decor)! Looking for more of our farmhouse master bathroom renovation? If you love this faux shiplap wall in our farmhouse bathroom, check out the shiplap accent wall we added to our living room! 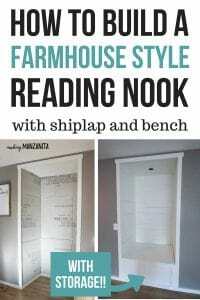 You’ll also probably this cute little farmhouse reading nook we added! I wondered how you finished it at the bottom. That would be been a good photo to show. Maria, we didn’t do anything special at the bottom. We just placed the bottom piece of faux shiplap directly on top of the trim piece. We also added a bead of chalking (just like we did on the sides of the wall as shown). Let me know if you have any questions! I also wondered how you finished around the pipe from the toilet that goes into the wall? Hi Katie! That’s a great question. Our pipe actually comes up from the floor, not the wall, so we didn’t have to worry about this. Here’s a picture of how it looks back there. What paint finish did you use? Gloss? Semi Gloss? Eggshell? Flat? How is the shiplap holding up with the moisture of the bathroom? Jana, it’s doing great. We always run the fan while showering and afterwards and we used a high quality semi gloss paint over top of the shiplap. Thank you so much for the tutorial, I just finished installing mine behind my toilet in the master bath and it looks great!! How wide did you cut the boards? I’m hoping to do this in my 1/2 bath this weekend! We cut the boards 6 inches tall. Good luck with your wall. Come back and share a picture here when you’re done (or tag me on Instagram or Facebook @makingmanzanita ). I’d love to see it ! The underlayment plywood is 1/4″ and drywall is usually 1/2″. You want to locate your studs and use a brad nail at least 1 1/4″ to get into the stud. Hope that helps 🙂 good luck with your project. What type of wood boards did you use for the faux shiplap? 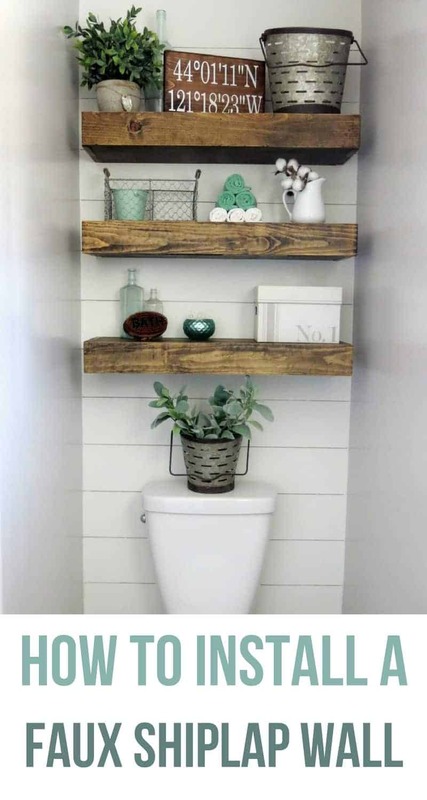 I have a powder room with almost the exact same dimensions, but I was thinking about doing shiplap on all the walls so that I don’t have to deal with the horrific wall paper situation. I feel like the room needs some interest. I saw a picture of the entire room done and it looked awesome. Hello, We installed a ship lap wall in the exact same “toilet room” as you have in the back of the toilet, the product was at Home Depot. We also installed a cubicle over the toilet to store towels as our master bath didn’t come with a linen closet. 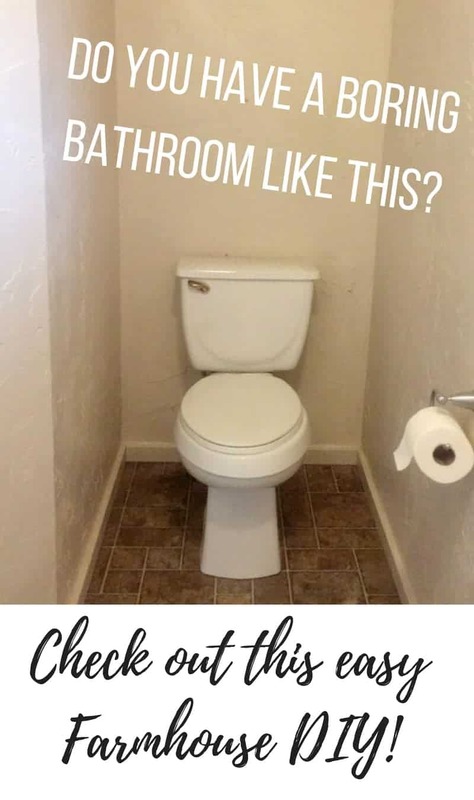 Now we are considering (& have purchased) more of the same material for the left & right sides of the toilet to install chair rail height but I’m skeptical now & need someone’s opinion before proceeding. I guess I’m 2nd guessing myself, thinking will it be over done in such a small space. Please give me your opinion. Thank You! In my eyes, there can never be “too much shiplap” 🙂 But it is totally personal preference. I’ve seen it done and every wall from floor to ceiling and I loved it, so I don’t think it would be too much. I would love to do this to my powder bathroom, I am just afraid I would hit a water line behind the toilet. What is your advice?